When I left off with Part 1 of this blog, I was in Winside, Nebraska, where I lived for a large chunk of my childhood. After sending Part 1 off to John King, I spent one more day in Winside before getting back on the road, and made a large garden-heavy dinner with Lin Brummels, her son Zeke and his wife Mollie, and her daughter Liz. Lin’s cilantro and spinach were taking over her garden, so I made cilantro hummus and we steamed spinach, grilled huge chicken breasts, and sautéed mushrooms and Brussels sprouts in salt and pepper. I hadn’t seen Zeke since 1998 and Liz in even longer, but I wasn’t surprised that they have turned into exceptionally kind, articulate, funny adults. It also came out that the next people to occupy the old farm house my family had lived in were two women who used it as a brothel, departing quickly once winter hit. 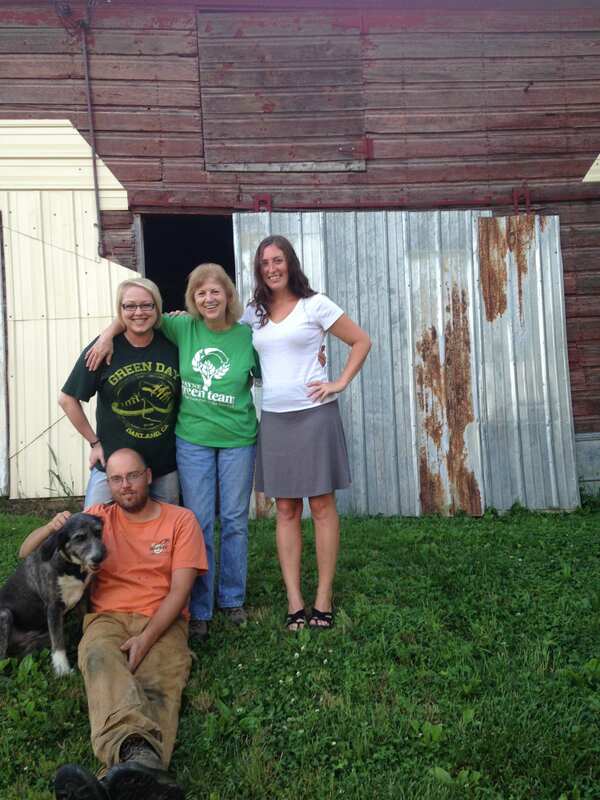 The Brummels got a dog out of the deal, named John Dog after the john who’d abandoned it near starvation. The next morning, I left with a heavy heart, hoping to find myself back in Winside soon. 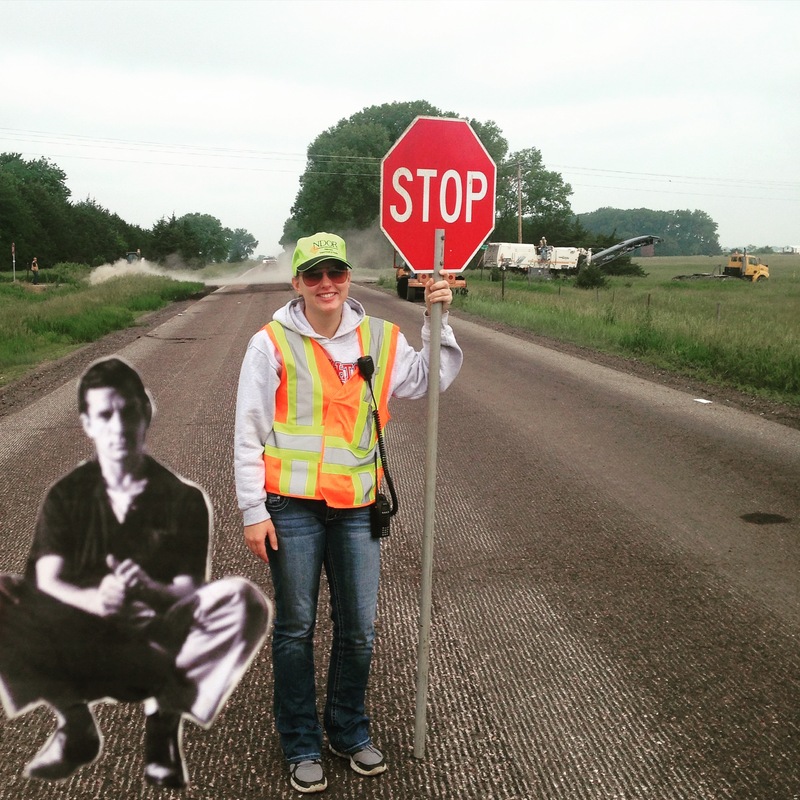 I was stopped by road construction outside Pierce, Nebraska, and photographed Flat Jack with a local girl, holding the “Slow/Stop” sign, who had taken Flat Stanley on her family’s vacation last summer. I stayed on Nebraska highways as long as possible before cutting through the impoverished Rosebud Indian Reservation in South Dakota. Groups of men walked down the highway, heads tucked to chests, and a drunk man attempted to kiss a woman on the sidewalk and was pushed aside and lectured as he laughed. 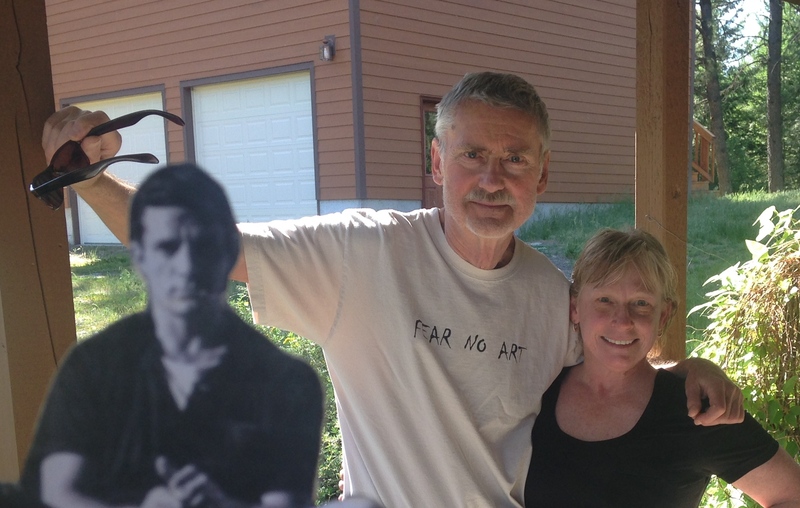 I spent two nights in Spearfish with a friend from the University of Idaho MFA program, Matt Bauman. He teaches five classes of comp a semester and, while still kind, there is now a pervasive sadness about him. He isn’t writing much and isn’t submitting his work for publication. We Googled colleagues from the program, and I was shocked to find that most of our talented group are, like Matt, not publishing. We did a short hike to Roughlock Falls in Black Hill National Forest, went to the lookout tower on Terry’s Peak, and explored Deadwood. I left hoping that Matt would launch himself back into his writing. I put in a 626-mile hard-haul through Wyoming to Salt Lake City where I stayed a night with David and Carol Kranes. On the way, I crossed the North Platte River, which was placid, but a couple dozen miles later, it was narrower and rushing. As I cut through Rawlins, Wyoming, to get on I-80, a deer stood so still in a cemetery, I thought it was a statue. 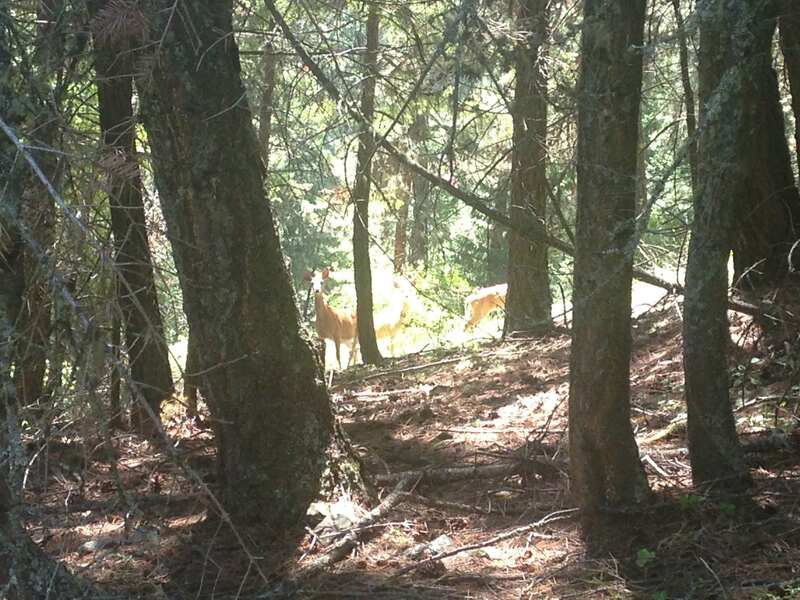 As I was about to look away, the deer bolted across the cemetery and was gone. I hit Salt Lake in late-afternoon. I am a fan of David Kranes’ work, especially a 1989 novel, Keno Runner. He was the artistic director at Sundance Playwrights Lab for fourteen years, which is where he and my father met in 1990. David and Carol immediately poured wine and set out a spring guacamole with chunks of cucumber that I need to request the recipe for. We told stories about family friends from the Sundance era, and talked books and travels. There is the bedraggled body of a deer behind a shed in their backyard, headless after guys working on their house must have cut off the head for the antlers! They are still obviously in love and have recently become grandparents. Although this was my first time meeting them, their hospitality made me feel at home and I hope to visit them again soon. I dawdled over breakfast and insisted on taking photos, but then hit the road again, for the 500+ miles to Reno. I think of northern Nevada as my father’s. Nebraska belongs to the family, but northern Nevada belongs to him. I was ages ten to twelve when we lived in Las Vegas, but Elko and Fallon and the great stretches of desert and scrub will always be in my father’s heart the way the Pacific Ocean is in mine. 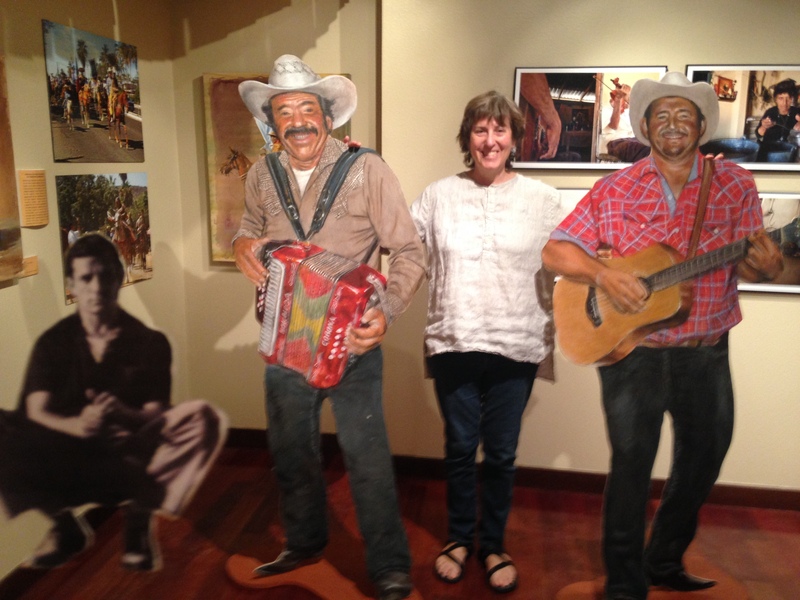 I stopped at Elko’s Folk Life Center and was given a tour by Artistic Director Meg Glaser. The gift shop has my father’s chapbooks and a Paul Zarzyski CD for sale, and I saw the stage where both have read their poems. Meg told the story of my father talking their way into Mona’s Ranch, a brothel, to buy t-shirts, and getting out just before they brought the girls down to try and sell an hour or two of old-fashioned Nevada party-love. In Reno, I checked into the El Dorado for $37 a night. Arian swung by to pick me up and we stopped by the local bookstore before hitting the bars to drink too much whiskey, as poets often do when meeting for the first time. We talked writing and books, and he told me how gentrified Reno has become since he left, but the bar we ended up at is still authentic, still a place where fights break out on the weekends. 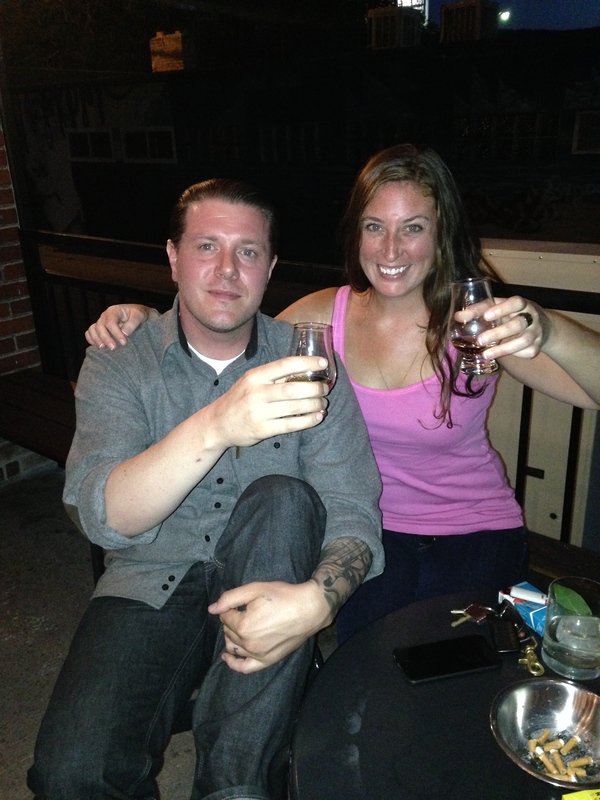 He’d bartended for years prior to grad school and it is a life he has no interest in diving back into. 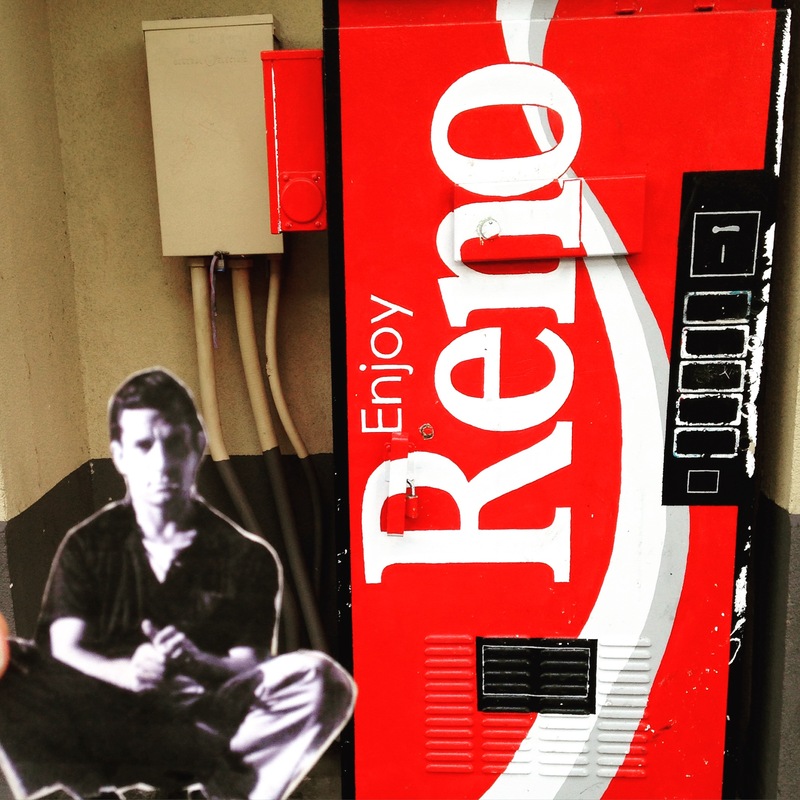 At a booth near us, a kid fell asleep, and although the kid’s friends were ignoring him, dancing and drinking, Arian said they would get him home safely, even if they had to carry him to his apartment; that is how Reno is. The next morning, I slept in and then wandered with Flat Jack, taking pics. 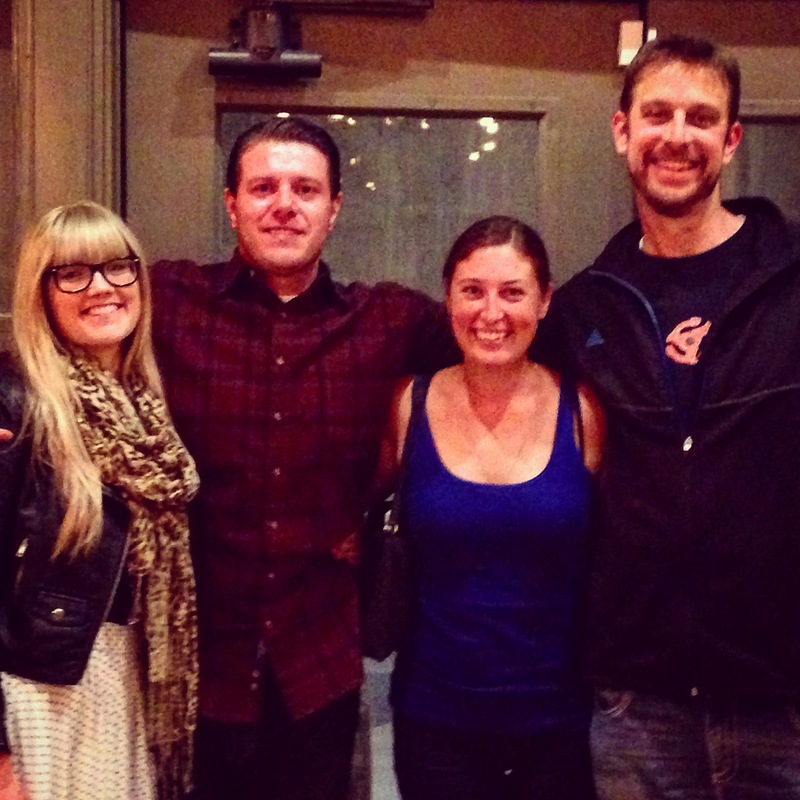 That evening I met up at the Depot, a local brewery, with Arian and his girlfriend, Jessica, a law student in Seattle, as well as Lindsay Wilson and the fiction editor for The Meadow. We called it an early night, at around 9 P.M., as I had another 600+ miles to drive the next day to Grangeville, Idaho. I left Reno in a torrential downpour, with heavy traffic that pulled off a little ways outside Reno on USA Parkway—there must have been a shift-change at a factory. I hydroplaned three feet into the next lane at one point, even though I was going below the speed limit. Luckily no one was in the lane! By Winnemucca, the rain had all but cleared off. As I crossed over into Oregon, I went through a small town, McDermitt. Feral cats crossed the highway at a leisurely pace and, a few miles further north, two bobcats dashed across the road and into the brush before I had time to stop for a photo. Although it was a nearly 600 mile drive to Grangeville, and despite the 55mph speed limits through Oregon, the day flew by as I went back and forth between Mountain and Pacific time zones. I’d been on the road for nearly 4,000 miles. Although road-tired, I was still curious about ever-changing landscapes, the people’s faces in towns I coasted through. I was fully enjoying my temporary gypsy existence. The American landscape is diverse, beautiful, and I’d been through lush southern forests, across the rich clay hills of agrarian northern Nebraska, the South Dakota badlands, Utah salt flats, flat stretches of Nevada desert…. On the road, everyone cuts forward, although yesterday is no more gone than where you nighted last. Because I stopped often to take pictures, I’d pass the same semis three times in one day. As a woman traveling alone, there are road-rules: don’t stop at rest stops or gas stations with no other women around, don’t linger anywhere too long or too far from your car, get in your car and drive on if strange men try to talk to you, don’t get pissed when a semi cuts you off to pass a slow RV, because it takes much more to downshift than it does for you to slow in a car, and say yes to the miles and how your mind drifts. 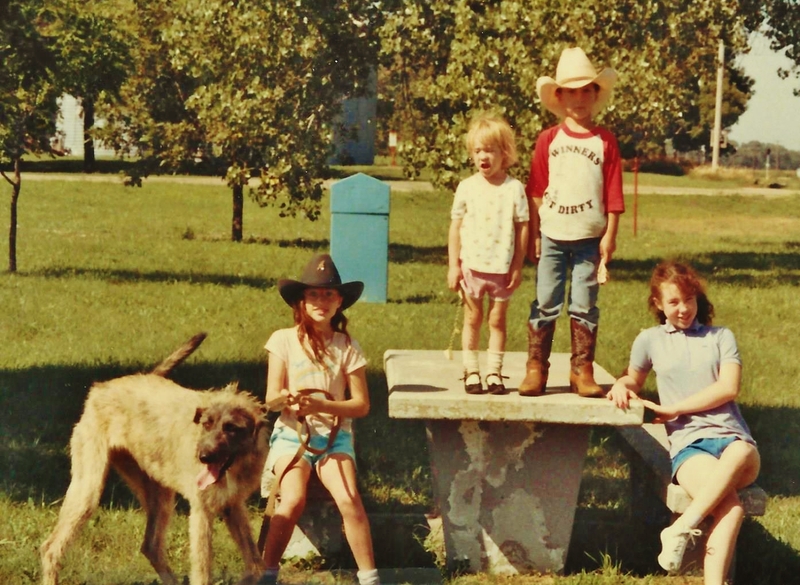 Cocoa, Ciara, Jessi, Luke, Mo, Lone Tree, Nebraska, July 28, 1988. I thought about how my family packed up an AMC Eagle station wagon in 1988, Cocoa the Irish Wolfhound in the very back, my mother, younger sister and brother in the back seat, and my older sister, Mo, and I sharing the shotgun seat—in charge of music and maps as my father drove—for the trek from Winside, Nebraska, to Las Vegas, Nevada. We did it again when we moved from Nevada to eastern Washington. Even before those epic road trips, my parents piled my older sister and I into a Pinto wagon to move just after Christmas of 1979 from the Bay Area to Fairbury, Nebraska. I find joy on the road. As I neared Grangeville, with only three nights left of my fifteen-day road trip, I realized my love for the road is the result of family moves that included many photo-stops, bologna and mustard sandwiches, truck stops where our Wolfhound would growl at anyone who came too close. It is the excitement of going somewhere new, and the desire for “what’s next?” once landed. On the move to Las Vegas, Mo and I Xeroxed copies of a Dwight Yoakam photo and wrote notes on them for hotel housekeeping or to leave on the back of toilets at gas stations. We had practiced his signature, so would sign each as if it were a personal note from Dwight. 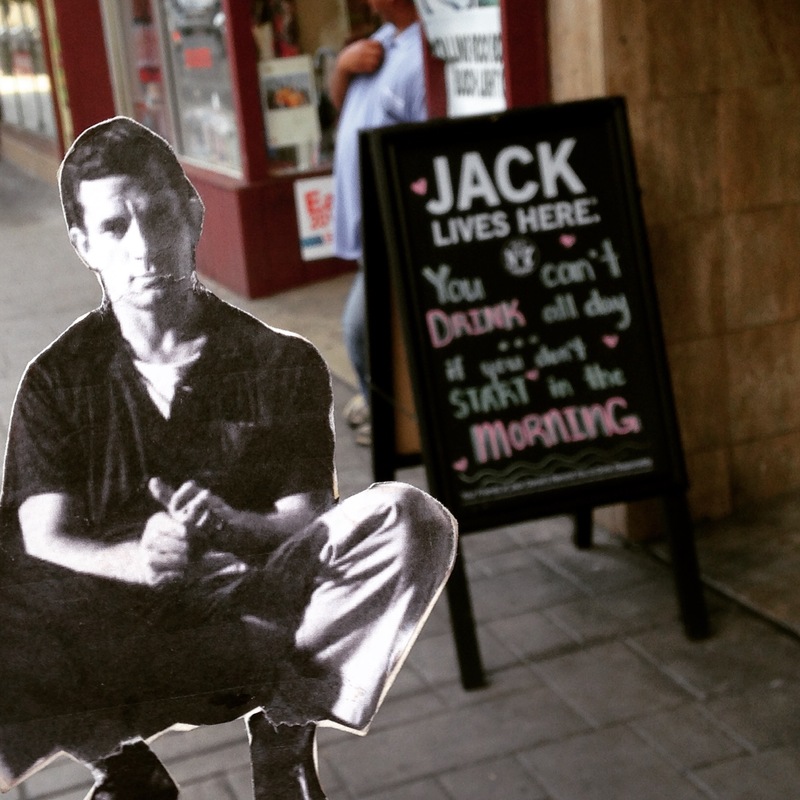 Having Flat Jack along on my post-Kerouac House road trip gave me a similar giddiness. It was Jack who insisted I find someplace to turn around on many two-lane highways to retrace our steps back to a creek or abandoned house or pretty horizon. 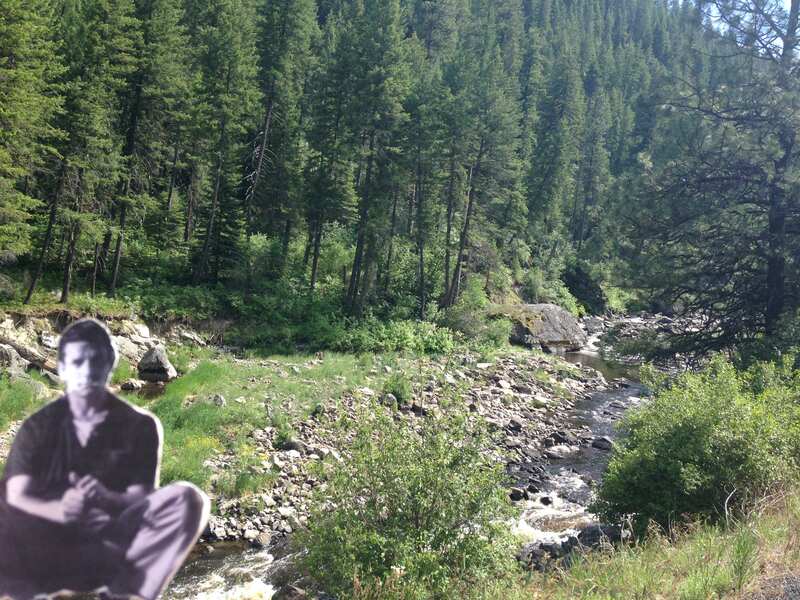 Often I’d say something about traveling alone and be corrected: “And Flat Jack.” Flat Jack became a major part of the trip, a curiosity for friends to follow on Instagram and Facebook. Flat Jack is also the catalyst for a book. 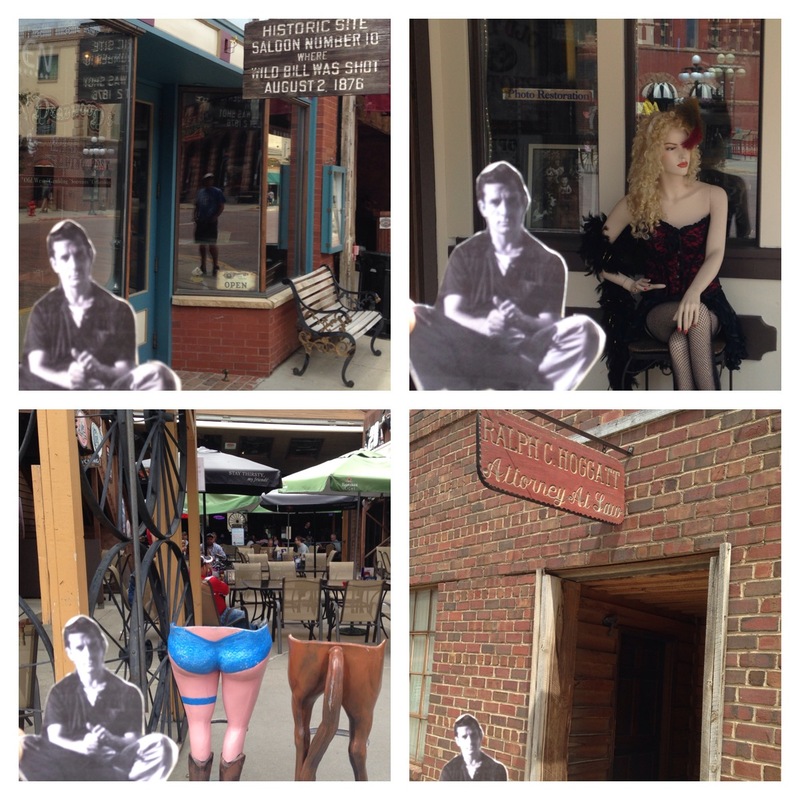 Kris Wetherholt of Humanitas Media Publishing saw the #flatjackontheroad images early in my road trip and contacted me through my father. 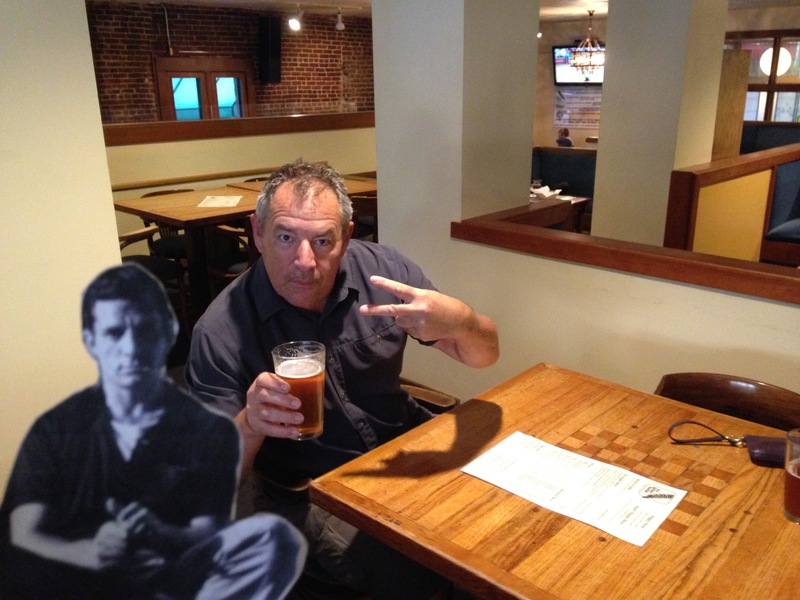 Would I be interested in doing a book of Flat Jack photos and stories from the road? 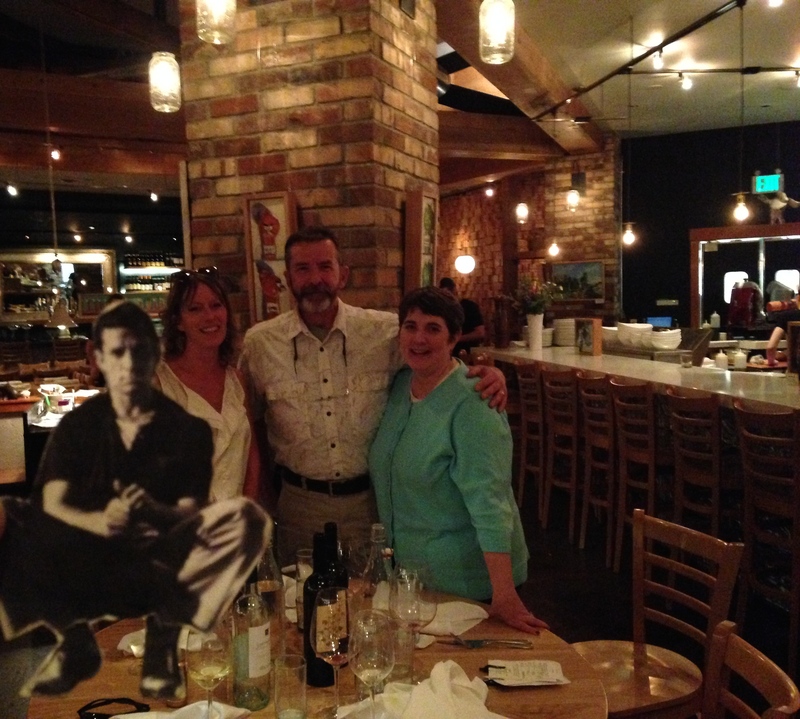 I became even more diligent about snapping pics with Flat Jack! I hit Grangeville in late-afternoon and Gary Gildner met me at the city park to lead me up the mountain to the home he shares with his wife, Michele. 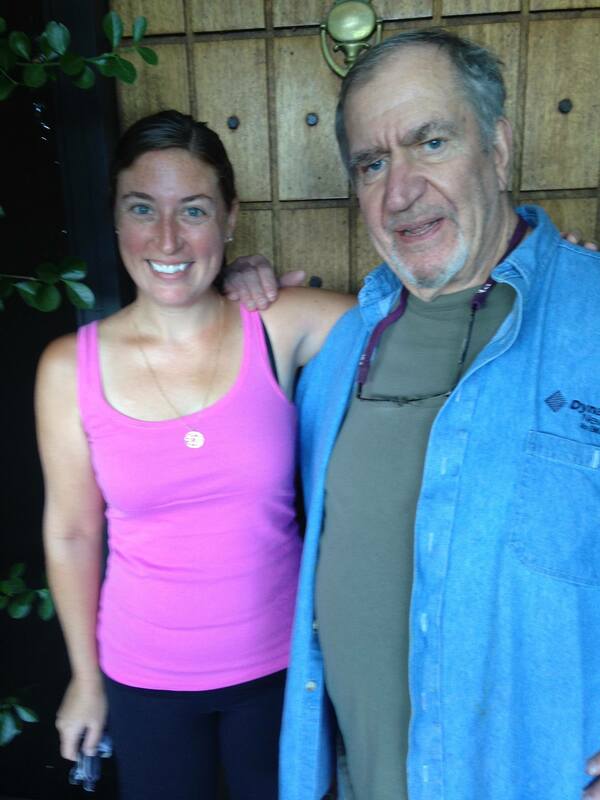 My father and Gary have been friends since before I was born, but I had not seen him in over a decade, and had not met Michele. This visit, like the Winside visit, was important, because I was reconnecting with someone, as an adult, who had known me since I was a child. Gary and I had spoken over the phone and corresponded via email when we published in the same issue of The Southern Review, but to share meals and wine and stories tied it all together. The Gildners set me up in the guesthouse they built above a two-car garage. The wood from the barn they’d torn down to build it lined the walls and framed the windows and bathroom mirror. It was like staying in a country resort. Michele left a TV tray on the bed with nuts and chocolate, a book, lotion (she knew I’d be dried out from the West’s arid heat after months in Florida! ), and the wifi password. 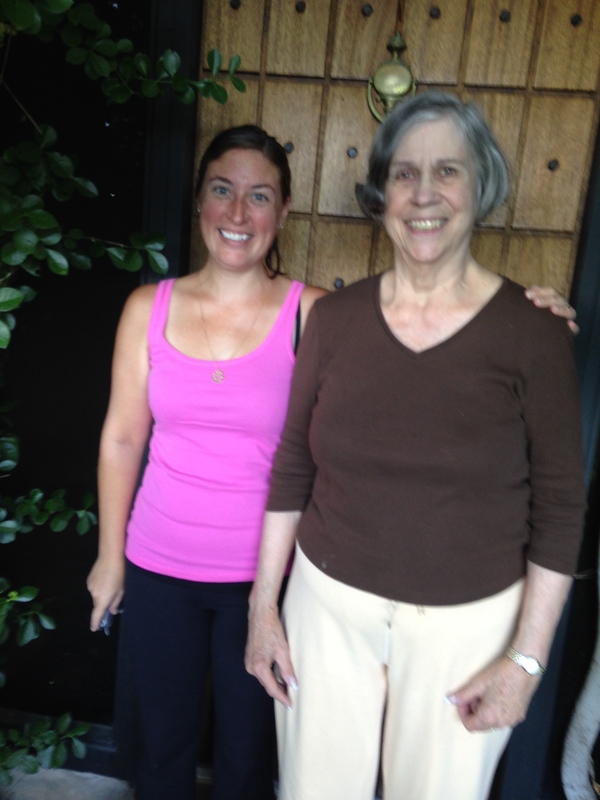 A true hostess and great cook, Michele made me feel at home… as if I’d known her for years. She is a graceful and lovely former ballerina. I spent as much time, if not more, with Michele as with Gary. 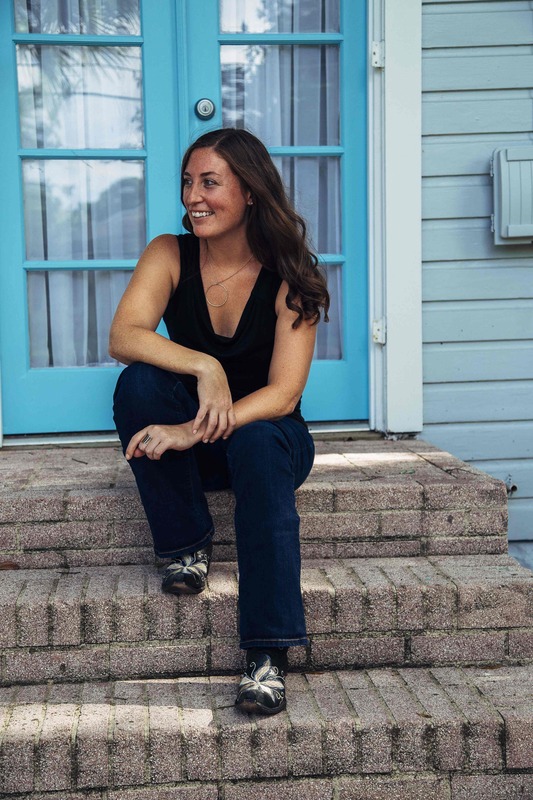 The memories that came up when trading stories were inspiring, and I plan on writing an essay about the six months my family lived in Gary’s Des Moines home while he was a writer-in-residence at Michigan State University and my father was visiting writer at Drake University. After two glorious nights with the Gildners—hiking, writing from place to place on their property, and spending afternoons and evenings with them, I hit the road again for a day in Moscow, Idaho, where I went to grad school. My first stop was Mary Blew’s house. I correspond with Mary regularly, so there wasn’t much catch-up to do, but she is someone I will never get enough of. Mary and I sat on her porch with whiskey, talked for hours before I headed up to the university campus to say hello to Yvonne Sertich, who had been my boss when I was Programs Manager for Executive Education, and then to Terri and Mike Gaffney’s home, where I would spend the night. After a glass of wine, we headed for Moscow’s Art Walk. I met friend and fictioneer, Annie Lampman, at the Prichard Art Gallery, and we swung by photographer Nick Beymer’s exhibition briefly before meeting Buddy and Camie Levy for drinks at the Garden, and meeting back up with the Gaffneys for dinner at Maialina. Jack (left) and Buddy Levy. I ran into countless friends and acquaintances along the way and was reminded how warm and welcoming Moscow is. Why did I think one night would be enough? It was a terrific way to end the road trip, a mini-reunion/mini-homecoming before driving the final miles to eastern Washington. Now that I have landed in the scabland of eastern Washington north of Moses Lake, I am beginning to write toward the Humanitas Media Publishing book, and will need to go through the 1,000+ photos I took on the road. I am also hunting down the original copyrights for the two Flat Jack images I used…to gain permission for use in the book. 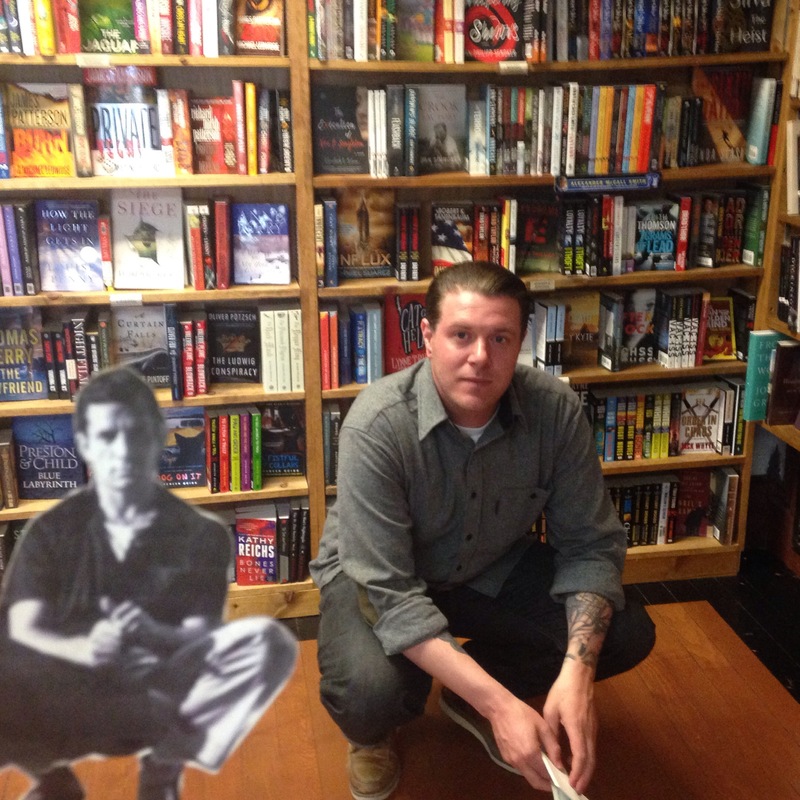 Humanitas Media plans on donating a portion of the proceeds to the Kerouac Project of Orlando. I am also pulling together a chapbook anthology, through my father’s Bunchgrass Press, of poems from a group of writers that significantly influenced my work and life while I lived at the Kerouac House. The chapbook anthology will be printed in an edition of about 100 on 100% cotton paper and will not be for sale, will only be available from the writers involved. This treasure will forever bind together, through poetry, some of my favorite people. 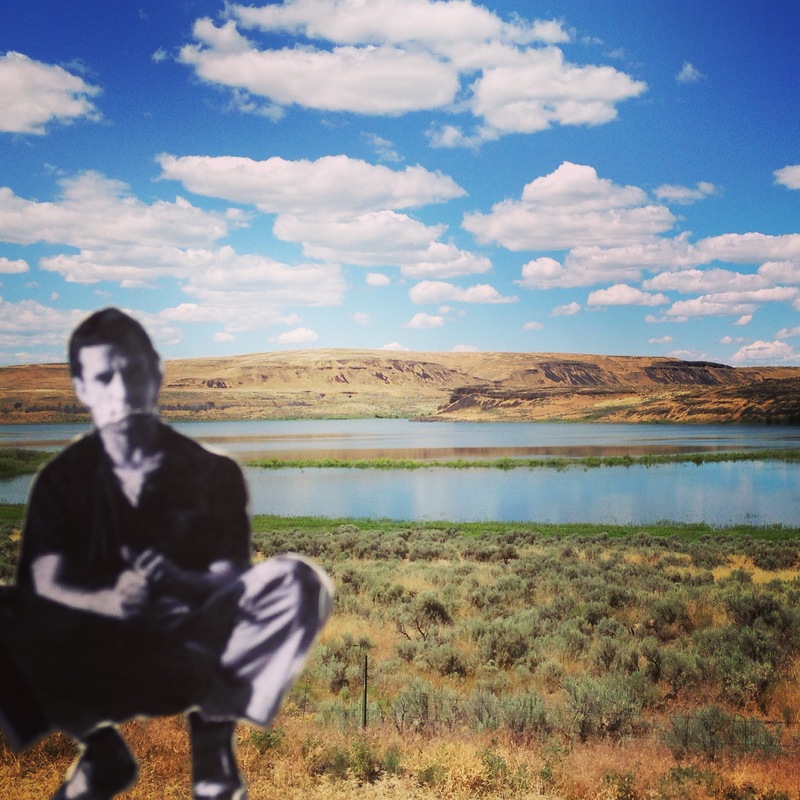 The road trip was the perfect way to extend the Kerouac House residency. I am grateful to Dona Black, Bret and Susan and Donovan Gottschall, Lin Brummels, Zeke and Mollie Brummels, Liz Daehnke, Carolyn Rabe, Bill Burris, Jim Hansen, Matt Bauman, David and Carol Kranes, Arian Katsimbras, Lindsay Wilson, Jessica Berry, Gary and Michele Gildner, Terri and Mike Gaffney, Annie Lampman, Buddy and Camie Levy, and so many others for the beds, meals, drinks, stories, and joy. I am also grateful to my folks, Red and Kate, who are my biggest fans and supporters, who are part of everything I do, and who will sleep soundly again now that I am off the road. Roughly 4,500 miles over fifteen days are behind me, but the projects will keep the residency and road trip—and Flat Jack—alive for some time.